Following Mitt Romney’s eight-vote Iowa victory, <em>Hour Detroit</em> revisits two interviews with Michigan’s native son. These stories, by freelancers Jack Lessenberry and Jim McFarlin, were originally published in 2007 and 2002, respectively. Willard Mitt Romney hasn’t exactly made this a centerpiece of his campaign, but, if elected, he would be the only president in history to have grown up a stone’s throw from Woodward Avenue. “Then, a little later — he wasn’t all that much older — we found out that he could identify any [model] and make of car by glancing at the quarter-panel,” adds his brother, G. Scott Romney, now an attorney and Michigan State University trustee. “I was telling someone in the campaign that story and he looked at me and said, ‘Scott, he still does that.’” That affection for all things automotive began when they lived in Detroit’s Palmer Woods, at 1860 Balmoral Dr., in a house that was substantial, but fairly modest for the exclusive neighborhood. There, Mitt came into the world a trifle unexpectedly on March 12, 1947. His mother, Lenore Romney, had thought she couldn’t have any more children. Lynn was almost 12, then, Jane nearly 9, and Scott, almost 6. The family was thrilled by the baby, who was named after his father’s best friend, J. Willard Marriott, of hotel fame. The middle name of Mitt was for a relative who played football for the Chicago Bears. But his birth was not an easy one, and it took a toll on Lenore. “Mom was never the same again [though she lived a long life, dying in 1998 at age 89],” says Scott, who is now a partner at Honigman Miller Schwartz and Cohn. Recalling the after-effects her mother endured after the late-in-life birth, Lynn says, “She had to stay in bed for almost two years and never really recovered. She used to play sports; she never really did again.” The upside was that Mitt may have gotten more time with his mother than the others. The youngest Romney was 6 when the family moved again, to a house near Lahser Road. Then, it was out to a street right off Rathmor Road in Bloomfield Hills. Today, theirs is almost certainly the only subdivision in the state that has been home to three candidates for governor — and two who have run for president. The elder Romney, who cut his political teeth by leading a successful drive for a new Constitutional Convention, was elected governor three times, in 1962, 1964, and 1966. Geoffrey Fieger, who has built a palatial residence across the street from the old Romney home, didn’t fare quite so well as the 1998 Democratic gubernatorial nominee. Mitt’s time would come much later, and in another state. He first left the family home to go to college at Brigham Young University in Utah, naturally. He did two years of Mormon missionary service in France, where, his brother noted, he made few converts but did become fluent in French. He returned, married his high-school sweetheart, Ann Davies (he went to Cranbrook, she to Kingswood), and never looked back. He finished college, where he was valedictorian, and took off for Harvard University.â€¯Harvard Law School is notoriously difficult. So is the M.B.A. program. Mitt Romney did both simultaneously, earning twin degrees in 1975. After graduation, Mitt stayed on in Boston, fathering five strapping sons, working first for a management consulting firm, and then going on, with the blessings of his bosses, to start Bain Capital, a private equity investment firm. There, he became something beyond rich. Fortune magazine estimates his personal fortune at $400 million. George, who died in 1995, was blustery, impatient, a man of action in a hurry. He would play golf by himself, rushing around and playing several different balls, usually badly. A charming man with a twinkle in his eye, he could also give in to quick flashes of temper. By comparison, Mitt comes across in an interview as, well, almost the bionic man. Taller, and even more handsome than his father, Mitt always appears band-box crisp, even when he departs from his usual tailored suit for a rare appearance in a polo shirt and slacks. One gets the impression he would look neatly pressed halfway through a rugby match. His answers to nearly every question seem carefully calculated and calibrated. Would he lead a crusade to save the automotive industry, the economic mainstay of his ancestral home, the business to which his auto-executive father devoted the best years of his life? “I care very deeply about the manufacturing base of this country, and I believe the automotive industry is an important contributor to our vitality nationally,” he says, sitting at a small table in an office of the Demmer Corp., on the outskirts of Lansing on a Saturday afternoon in late spring. “… So I want to see the domestic automobile manufacturers succeed.” He goes on to detail his support for basic science, energy independence, more fuel efficiency, though not necessarily mandatory ones. He backs many safe things. Outside, hundreds of party faithful are excitedly waiting to see the man to whom they have donated money and to rub elbows with for a few moments. “STRONG. NEW. LEADERSHIP,” their signs say. “Oooo, he looks even better than his father!” coos an elderly woman who’s dressed for the occasion in a red, white, and blue boater. Make no mistake, he’s the Michigan Republican Party’s man. Yes, there were a dwindling few John McCain supporters who swept Michigan’s primary in 2000; some for Rudy Giuliani, and some hoping for Fred Thompson. His strategy for winning the nomination is easy to discern. Rudy Giuliani led in the early polls but that, he believes, is based almost entirely on his courageous performance on Sept. 11, 2001. Republican primaries are, however, dominated overwhelmingly by social conservatives. The Romney forces — though not the man himself — are already sending the message that theirs is the only candidate who has been married just once. Giuliani — who carries the domestic baggage of three marriages, rumored affairs, and estrangement from his children — is basically pro-choice. “That’s more torpedoes than one hull can handle,“ as one Romney supporter put it. When that is generally known, they believe the New York City mayor will fade into the background. McCain seems, by his passionate embrace of the war, to have lost his former support of mavericks without winning over the right wing. As for the rest, few know their names (Tom Tancredo? Ron Paul?). And it’s hard to see where the millions could come from to make them competitive. “I would hate to be getting in at this late stage,” Mitt says, in a moment of candor. That’s because the nominations of both parties are almost certain to be decided by what amounts to a “national primary” involving perhaps half the states, from New York to California, and possibly including Michigan, on Feb. 5. Nationwide TV advertising will be needed. That takes money. Big money. The Romney campaign has been raising it. When needed, Mitt has been pouring his own millions in as well. The machine runs like clockwork. Yet he is not a man without emotion. He adored his mother, and was visibly moved when he saw Oakland County’s Betty Bright show up with an old Lenore button, from a disastrous run she made in 1970 for the U.S. Senate. But his real hero was, and is, his father. George Romney’s own run for president took place exactly 40 years ago. There’s an odd symbolism to the number 40 between father and son. George was just a few months shy of that age when his youngest son was born. Mitt was elected governor of Massachusetts exactly 40 years after his dad did the same in Michigan. 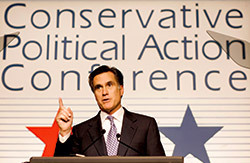 That first Romney campaign is notable for 15-year-old Mitt’s first and, some say last, political gaffe. George’s campaign survived that easily. He defeated a Democratic incumbent, then won two more terms as governor by landslides. Reportedly, he was the one candidate John F. Kennedy feared facing in 1964. He saw 1968 as his year. Forty years ago this fall, the polls had George as the frontrunner for the Republican nomination. The first real test, the New Hampshire primary, was to be on Mitt’s 21st birthday. But the youngest son took no part in the campaign. He was off doing his missionary service. George’s campaign blew up after he told Detroit TV interviewer Lou Gordon, “I just had the greatest brainwashing that anybody can get when you go over to Vietnam. Not just by the generals, but by the diplomatic corps.” Everyone acknowledges today that what he said was true. What was wrong was his unfortunate choice of a word. “I would have thought a light rinse would have done it,” U.S. Sen. Eugene McCarthy sneered. Editorial cartoonists had a field day. Later, Theodore H. White, in his The Making of the President 1968, revealed that the national press corps had decided that Romney was too hopelessly square for national office. So, they were willing participants in bringing him down. Nelson Rockefeller, Romney’s biggest public backer, turned out to be interested in running himself. So on Feb. 28, the campaign ended. First, however, he wrote a six-page, single-spaced letter to his youngest son, the missionary in France. “I aspired, and though I achieved not, I am satisfied,” he wrote. Forty years after George was first elected governor of Michigan, Mitt followed that same path, winning the statehouse in heavily Democratic Massachusetts. It was his second try for office. For a while, amazingly, Romney led in the polls. The entire clan, headed by his then 87-year-old father, took off for Massachusetts, campaigning like mad. Then Kennedy asked the voters’ forgiveness for his past indiscretions. There was a single televised debate, in which Teddy blew Mitt out of the water. â€¯Mitt knew what was coming. But George called his older son, Scott, who was in an important client meeting. “Scott! We all have to go to Massachusetts. We can still win this thing! We need to fan out all over the state like the Kennedys. We can still win this thing!” “Dad,” Scott said gently, “It’s Mitt’s race. Don’t you think 10 years from now he’ll want to say he did it his way?” There was a pause. “Oh, you are right!” George Romney replied. The final score was Kennedy, 1,266,011, Romney, 894,005. It was Kennedy’s closest race since he had come into the Senate in 1962 — but not really very close. “He was devastated. Nobody saw that, but he was. He told me it took him six months to get over it,” Scott remembers. Mitt hated losing. And he did not intend to lose again. Eight months later, in Bloomfield Hills, Lenore awoke. Her 88-year-old husband always got up early, ran on the treadmill, then left her a rose and a note by her bedside. There was no rose that morning, and no note, and she knew. Mitt came home for the funeral. “The common thread of his life was helping others,” Mitt said of his personal hero. Four years later, the son followed his father’s lead and “helped” by taking over the scandal-and-deficit-plagued Salt Lake City Winter Olympics Organizing Committee. Nobody argues that he did anything less than a stunning job, erasing a $379-million deficit. The 2002 Winter Olympics went off on budget and without a hitch. By that time, Mitt was well into running for governor of Massachusetts, having deftly pushed aside the bumbling incumbent, Jane Swift. This time, he won. As governor, he once again closed a budget deficit, and pushed through a controversial plan that provides some form of health care for all citizens, but requires them to pay for it. “I want health care, not Hillarycare,” he said. “There is no question in my mind that we can get every citizen insured in this country without new taxes and without a government takeover,” he says. Critics in Massachusetts say he lost focus his last year on the job once he set his sights on the White House. When he tried to get more Republican candidates elected in the state in 2004, he failed badly. Will he be the next president? Talking to Mitt Romney, one gets the impression that he is absolutely convinced that he is by far the best qualified and most skilled man for the job. This comes across less as arrogance than as the quiet confidence of a pro. What matters, he says, is character and ability. He parries the frequent (and quite correct) charge that he has become much more conservative on social issues than he was when he first ran for office in Massachusetts. Yes, he has changed his position on abortion, he admits. The rest is overblown, he argues unconvincingly. It’s clear that he knew what it took to win office in Massachusetts, and that it takes something very different to win a Republican nomination for president. And he changed his position. Yet that’s not what we should be looking at, he says. “If you look back at the history of the country, the issues people campaigned on generally turned out to be quite different from the issues that defined their presidency,” he says earnestly — and accurately. Mitt Romney clearly believes he has them. So does Peter Karmanos Jr., chairman and CEO of Compuware, and one of Romney’s biggest donors. Karmanos isn’t especially political; he hasn’t been involved in politics before. But he’s convinced Mitt is the real deal. There is, of course, the Mormon thing. Fully half the country, a recent Newsweek poll showed, would have great difficulty voting for a Mormon for president. They see the Church of Jesus Christ of Latter-day Saints as a cult. John F. Kennedy made a famous speech to a group of Protestant ministers in Houston the year he was running, in an era when some people didn’t think a Roman Catholic could put the nation ahead of the pope. He reassured them, and won the election. Most see Mitt, making such a speech at precisely the right time. He will say that he is a Christian, that he believes in Jesus Christ and the Constitution, that religion is a private matter. He will say that those who support polygamy have no more in common with him than David Koresh has with the Methodists. And then, as he sees it, he will win. Because he worked harder and longer and was more self-disciplined than anyone, and because he was meant to. What he’ll do when he gets to the White House may not be clear. Except that he’ll try to do it in a way that would have made the old man proud. Lessenberry is a political writer and Wayne State University professor. 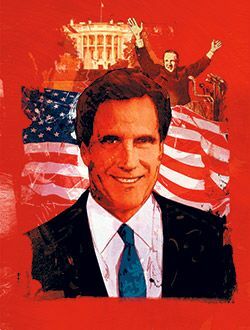 Read on for an interview with Romney in 2002, before his successful bid for Governor of Massachusetts. Security for the 2002 Winter Games has taken on Olympic proportions in the wake of 9-11. The Secret Service — which is responsible for the overall protection plan — promises an airtight ring around Utah, The New York Times reports. That means sky-high perimeter fences, acres of restricted areas, sharpshooters perched on every peak, and more than 3,700 U.S. military members in the international guard. And still no one will feel completely safe. Into this cauldron of counter-terrorism slaloms Michigan native and Cranbrook graduate Mitt Romney. It’s not enough that Romney, 54, had to rescue the very image and integrity of the Games upon becoming president and CEO of the Salt Lake Organizing Committee in February 1999 — right after two Utah businessmen were alleged to have secured the Olympic bid by paying more than $1 million in bribes, igniting the ugliest scandal in Olympics history. The multi-millionaire Boston financier and youngest son of the late three-time Michigan governor George Romney also has been charged with making America safe for the world and its winter sporting spectacle, echoes of the bomb in Atlanta and the tragedies at Munich in 1972 impossible to ignore. Romney was described in SKI magazine as “too good to be true: movie-star handsome, married to his high-school sweetheart, father of five sons and Mormon, a life that seems lifted directly from an Ozzie & Harriet script.” So he could be forgiven for wondering why — after slashing a $379-million budget shortfall and vowing these Winter Olympics will end up in the black — the specter of doom-seekers also has to occur on his watch. Thankfully, there’s no quit in Mitt. Initially, he had no interest in such stimulation. He was head of Bain Capital, the Boston venture capital firm he co-founded in 1984, “and if you haven’t been watching the stock market the last 15 years, these have been very good times to be in investments,” he says. The company’s $13-billion portfolio includes Domino’s, FTD and Staples among its successful turnaround holdings. He was healthy, wealthy and content. Then the phone call came. “It was from a person I had a hard time saying ‘no’ to,” Romney says. “The idea for me to come to the Winter Games was originated by a friend in Salt Lake City, and he knew not to call and ask me because I would immediately say, ‘That’s ridiculous, I have no interest.’ So he called my wife, Ann, and he and she had a nice long conversation. Then she called me at the office and said, ‘Now don’t dismiss this out of hand, Mitt, you’ve got to listen.’ And she made the pitch. On track like Jesse Owens, says beaming brother Scott Romney, a partner in the Detroit law firm of Honigman, Miller, Schwartz and Cohn LLP. “Mitt’s an unusual, talented person with enormous ability and terrific judgment, and a compassion and interest in doing the right things,” he says. “He’s a remarkable person, he really is. Romney lost — decisively — and pundits claim one reason is that he refused to sling mud. “The reason I lost my political race is that Sen. Kennedy ran a better campaign than I did,” Mitt counters. “It was my first time out and I had a lot to learn. Given the uphill battle we fought, I was fortunate to come out as well as I did. “I loved the experience. My dad lived in our home for six months and campaigned with me almost every day. My sons also joined the campaign. It was a family experience we will always remember. I would be happy to consider public service again following my work here in Salt Lake City.” To that end, he has announced he won’t be returning to Bain Capital after his Olympic adventure concludes. About his first name — it’s not short for “Mitten,” in honor of his home state. “My full name is Willard Mitt Romney,” he says. “The ‘Willard’ comes from J. Willard Marriott, founder of the Marriott hotel chain and one of my mom and dad’s best friends. “Mitt is a family name. The first Mitt Romney was a star quarterback at the University of Chicago back in the 1920s who went on to play for the Chicago Bears. I think my folks hoped naming me after a successful businessman and a successful athlete would give me both skills. McFarlin is a frequent Hour Detroit contributor. 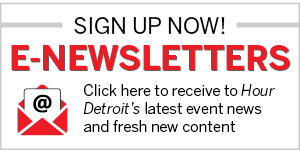 E-mail: editorial@hourdetroit.com.